When it comes to teaching and learning, there is no shortfall of old ideas, new ideas, latest and greatest, consultants, and advice. When sorting through all of the options, it is critical to ask lots of guiding questions. How does this idea fit in our specific context? Does it make what we currently do well better? Does the approach fit with our big ideas and core values? What challenge are we trying to solve? Do we share a common vocabulary? Does the idea connect with and support current best practices, or is it just “one more thing”? Does the idea allow for flexibility and customization or is it a “one size fits all approach”? Why are we doing this? Do we have an agreed upon map and vocabulary? Can the idea be used by the adults and the students? Is it done “with” people or “to” people? Is it built on best practices and research? Challenge Based Learning provides an efficient and effective framework for learning while solving real-world Challenges. It can be used by every stakeholder in the school to develop strategic planning, connect current practices, strengthen ownership and personalization, and create life-long learners. Instead of competing with other approaches it seeks to make connections and help all of the stakeholders to co-create the learning experience.So why CBL? CBL provides learners with a framework for addressing challenges that can be used to learn and make decisions inside and outside of school. CBL creates an authentic connection between the world of the learners and the academic expectations of schools. Challenges push us to go above and beyond by demanding action. CBL provides the “why” for subject area content acquisition while building important life and career skills. CBL expands the ownership of education and moves the learning experience beyond the four walls of the classroom. CBL facilitates creative and divergent thinking and through a process that slows the process down allowing for full participation and reflection. 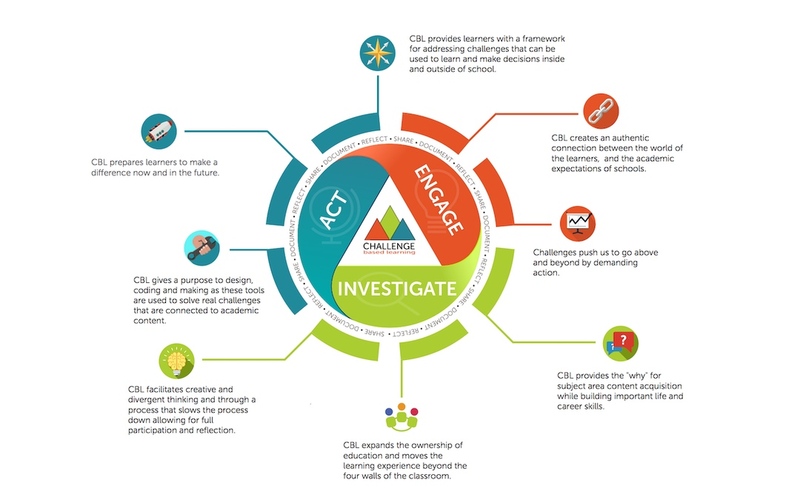 CBL gives a purpose to design, code, make and advocate as these tools are used to solve real challenges that are connected to academic content. CBL prepares learners to make a difference now and in the future.